purchased 36 bison to start its herd. By the 1940s, the size of the herd had swelled to 2,500 . . ."
Turned out, the range lands in the 73,000-acre park couldn't support that large of a herd of buffalo ("Tatanka" in the native Lakota Indian language) during the winter, so management techniques were instituted to keep them and the ecosystem healthy. For several decades now, the size and structure of the herd has been ingeniously maintained through buffalo roundups and auctions in late September. 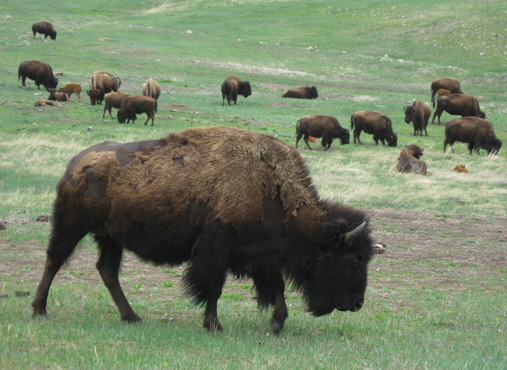 The number of bison that remains is based on the predicted availability of grassland forage each year. 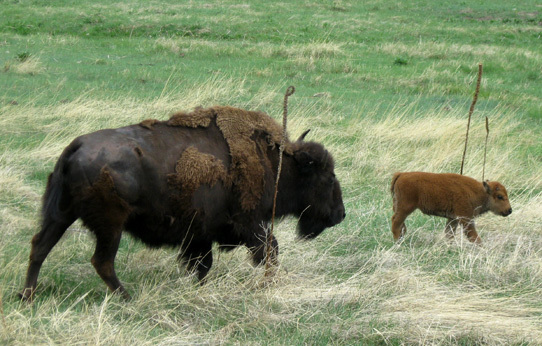 According to the park guidebook, the spring birthing season rejuvenates the herd size toward 1,450 to 1,500 animals. It looks like this was a good year for babies, considering how many we saw with their mamas today. The 44th Annual Buffalo Roundup is September 28, 2009, if you're interested in a unique experience. The roundup has grown from a utilitarian task to a popular event attracting more than 11,000 people each year. Park management was smart to pick up on that and earn some extra income from tourists! Two viewing areas are set up on the prairie so visitors can watch in awe as 1,500 bison come thundering over a ridge and down into a system of corrals, where they are tested, vaccinated, branded, and sorted. Most of the bison, about 950 to 1,000, are released back into the park. The remainder are sold at auction the third Saturday of November to buyers from all over the US and Canada for breeding or slaughter. I don't like to think about eating magnificent critters like elk and bison, but I've had burgers made from both and I can tell you I prefer them to beef. Now I think a buffalo roundup of that magnitude would be a pretty cool thing to watch! Depending on our race and travel schedule this fall, we just might find ourselves back in Custer State Park at the end of September. 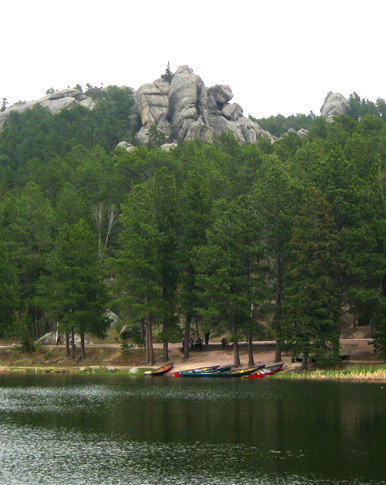 Custer State Park is another one of those Black Hills treasures that Jim and I didn't explore until recently. 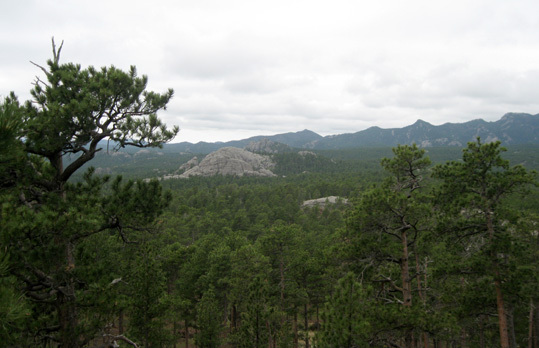 Keep in mind that the entire Black Hills National Forest is 'way over a million acres. It has so many amazing natural features, wildlife, and history that it could take years to see and explore everything. 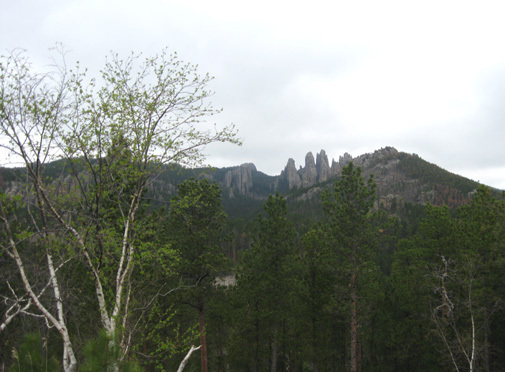 The large state park is only a fraction of the Black Hills experience -- and the three or four hours we spent in the state park today are only a fraction of of all the things to do and see just in the park. But I guarantee you we got our money's worth! Note the logo of the bison, one of the park's most valuable natural resources. I admit that I was a bit surprised initially at the $12 fee for the two of us to enter the park. That "license" is good for up to seven days, however. It was our choice to visit only one day and forfeit the other six. I'd like to camp inside the park in the future and have time to hike or run the trails and participate in activities we couldn't do this time. The annual license is a real bargain for people who live in the area. I gotta tell ya, I've always loved seeing the buffalo at Yellowstone National Park. When we lived in Billings, Montana, we visited Yellowstone at various times and often saw small herds of bison from the roads and ski trails. 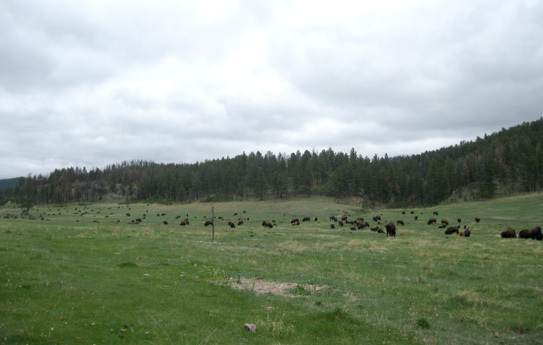 I've also seen small herds on private ranches in the West, but I've never seen a herd like the huge one we saw at Custer State Park! That alone was worth the cost of admission to me. You'd be surprised how fast I can run! BUFFALO ARE DANGEROUS. PLEASE, DO NOT APPROACH. This cute little thing probably already weighs 200 pounds. Cody was as respectful of the buffalo as any other large animal he's seen, like cattle and moose. He's much smarter in that way than Tater (our yellow Lab) ever was. She loved to give chase, regardless of the size of the quarry. Cody never chases or even pays much attention to big game and livestock. He watched the bison curiously from the back window of the truck for a few minutes, then lay down to snooze. What fascinated Jim and me was soon a bore to Cody. We saw several small herds of buffalo and the herd with hundreds of them along the 18-mile self-guided Wildlife Loop through the southern two-thirds of the park. Although it was mid-morning by the time we got into the park, later in the day than recommended to view the most wildlife, we saw our share of interesting animals in the woods and meadows. 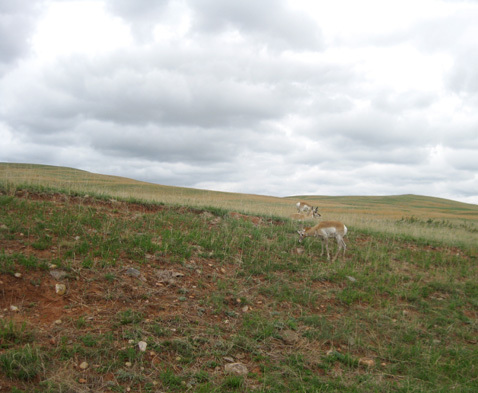 Custer State Park's diverse habitat supports a wide variety of birds and animals besides buffalo: elk, burros, bighorn sheep, mountain goats, whitetail and mule deer, pronghorns, mountain lions, bobcats, coyotes, prairie dogs, and other small critters. There are no bears or moose in the park. Bird species include the golden eagle, prairie falcon, western tanager, mountain bluebird, red crossbill, and many others. Bird watchers can get a list of birds at either of the two visitors' centers. According to the park guide book and our AAA Tour Guide, it's OK to feed the burros but not any of the wildlife in the park. 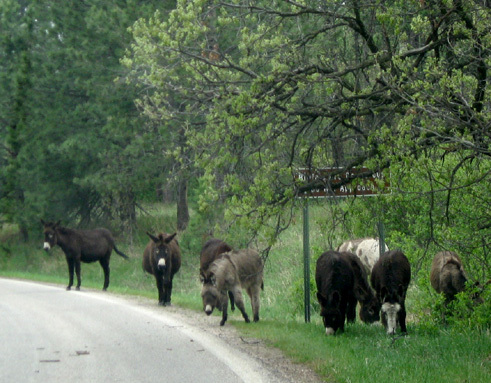 The burros aren't native to the Black Hills, although they do run wild. They are descended from a herd of burros that once hauled visitors to the top of Harney Peak, located a little north of the park. 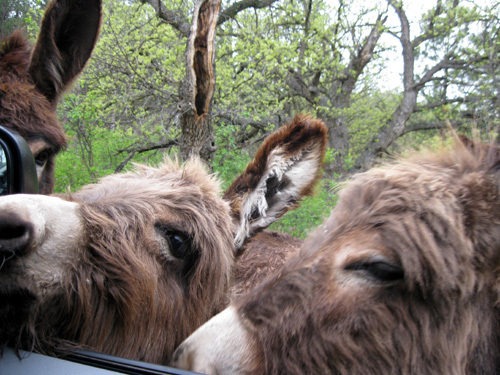 After the rides were discontinued the burros were released into the wild in the park. By now they've become so accustomed to people petting and feeding them that they are quite tame -- and persistent. They reminded me of the "wild" pony in the Virginia Highlands that wouldn't leave me alone when I was running/hiking the Appalachian Trail. I KNOW you've got some food in there! We didn't feed these guys. We didn't realize at the time that we could, or we would have taken some fruit, veggies, or bread to give them. 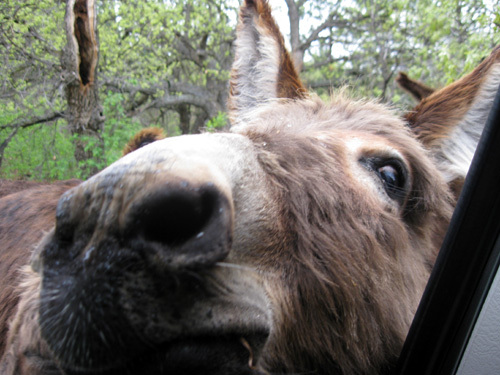 Cody was very curious of the burros since they had their heads in my window! He was allowed to touch noses with one when he didn't show any sign of fear or aggression. He's done that with friendly horses along the greenway in Roanoke. I doubt he saw much difference in these guys. 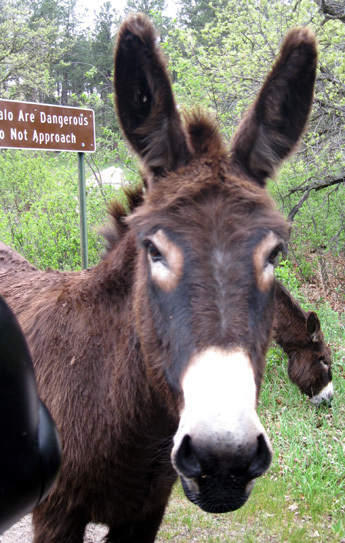 I'm not sure how many burros are running loose in the park. These eight were the only ones we saw today. As few miles later, as we crested a ridge, we could see two other pronghorns leaping across the road in front of us. We slowed, then pulled completely over when we realized they were chasing each other around long loops on either side of the road, back and forth. Fortunately, no other vehicles came along while we watched their show. They appeared to be young males who were engaging in useful play, thoroughly enjoying the act of running fast and learning some survival skills in the process. As runners, we were so fascinated that we watched them (enviously) for several minutes, wishing we had their energy, speed, and agility. They were moving so fast I didn't even try to photograph them. Later I searched for more information on the internet so I could properly identify them. 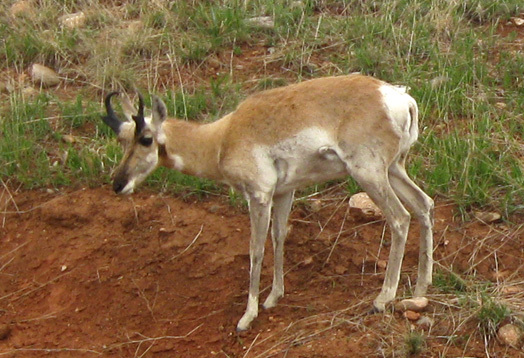 I've always heard the term "pronghorn antelope" but I learned that pronghorns are not antelope. Male pronghorns have branching horns they shed annually (females have smaller, unbranched horns). Antelope have unbranched horns they don't shed. we saw but I betcha he'd love to run with one of his buddies. 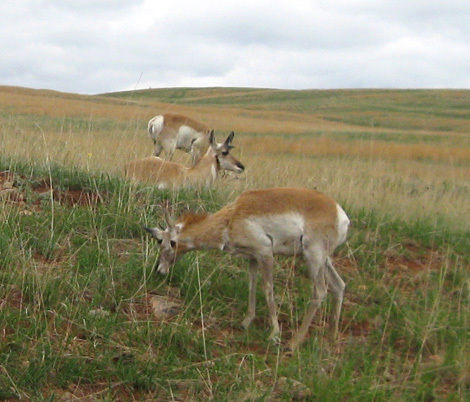 Pronghorns have remarkable endurance and can reach speeds of 40 MPH or more. Only cheetahs can run faster than pronghorns -- but pronghorns can run longer than cheetahs. Very cool. I now think of them as the best four-legged ultra runners in the animal kingdom. 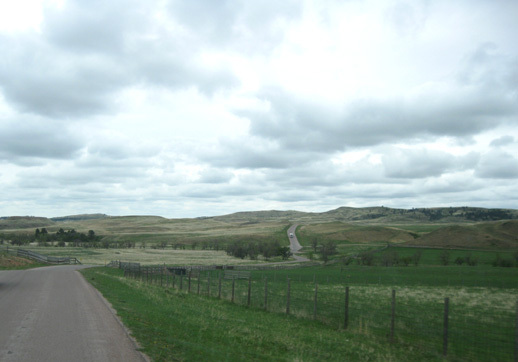 Although there are many miles of trails throughout Custer State Park, including part of the 111-mile Centennial Trail, we just traveled through the park via our truck today. 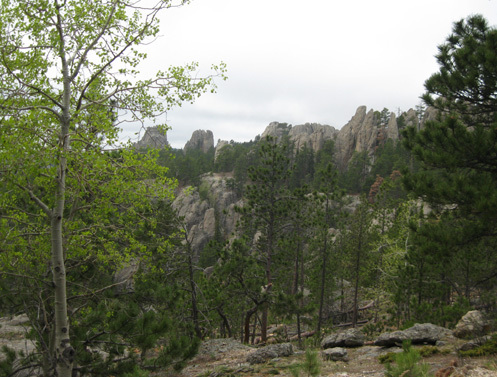 I wasn't familiar with which trails might be runnable for me; I chose to run on the smooth Mickelson Trail, another long trail through the Black Hills, after leaving the park. On our next visit to the state park I'd like to hike or run some of its trails. 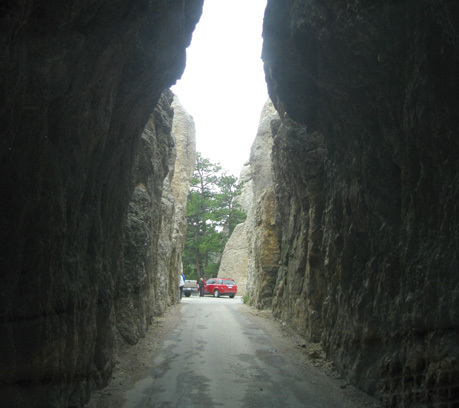 There are several scenic routes visitors can drive through the park to see a wide diversity of terrain from grassy meadows to an interesting maze of granite spires, tunnels, and canyons. 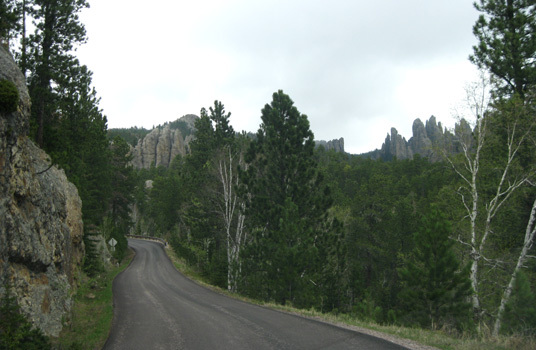 We entered the park from the northeast via scenic Iron Mountain Road AKA Route 16 Alt., which connects Mount Rushmore to Custer State Park. This is a winding, hilly road through gorgeous forests full of spruce, pine, aspen, and birch trees. Even in late May the deciduous trees are just leafing out at this altitude (mostly 5,000-7,000 feet) and there is no new growth yet on the evergreens at the higher altitudes. The new light green leaves and grasses are a lovely contrast to the deep green of the pines. We didn't see very many wildflowers in bloom yet. 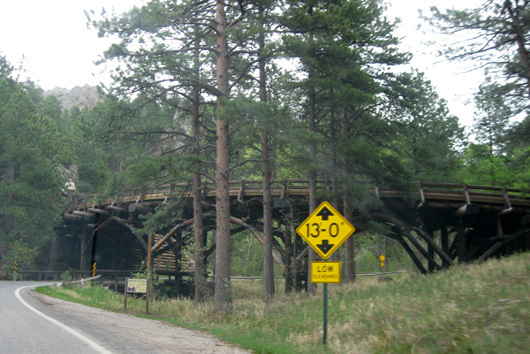 Three things most intrigued us on Iron Mountain Road: the series of loopy "pig-tail" bridges, the three tunnels that frame views of Mount Rushmore, and the numerous piles of logs and branches forming "tee pees" in the woods. 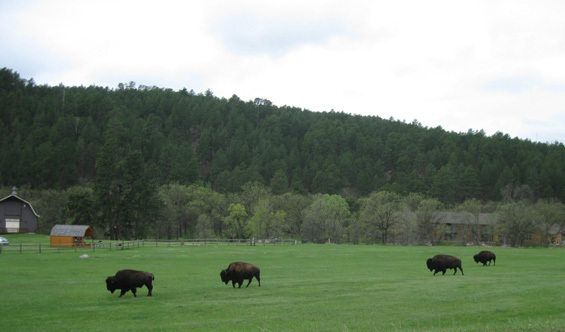 Peter Norbeck, the progressive conservationist, did a lot more than introduce the first bison into Custer State Park. The former state governor and US senator from South Dakota was also instrumental in establishing the park itself in the early 1900s and walking almost every inch of it. He dreamed of visitors exploring the park on foot but realized most people wouldn't do that. So he "found great pictures in nature and gave them to the world by building roads to them." These aren't superhighways, however. Drive the Iron Mountain Road or Needles "Highway" and you'll soon realize the 20 MPH signs aren't kidding. The curvy, mountainous roads were deliberately designed to be driven slowly so visitors can savor the surroundings. 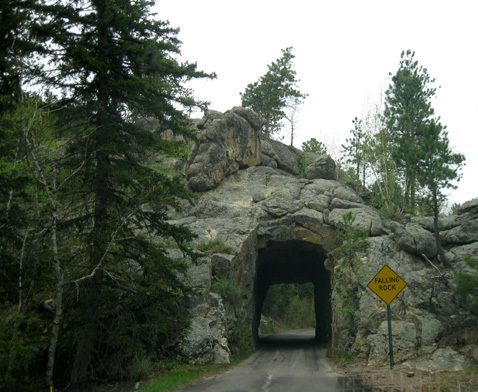 The spiral "pigtail" bridges (one is shown below) on Iron Mountain Road and very narrow tunnels on the Needles Highway force you to go even slower. 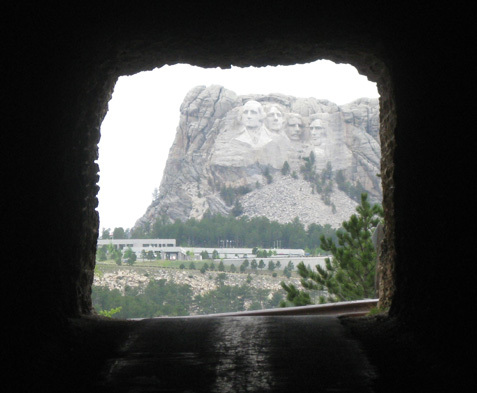 We were delightfully surprised when we passed through the first tunnel on Iron Mountain Road, looked back, and saw Mount Rushmore framed by the other end of the tunnel! How cool is that?! Two of the other tunnels on Iron Mountain Road also frame the monument and you can see it from several overlooks. No, they aren't tee pees for critters (well, not intentionally, anyway). Large fires in 1988 and 1990 burned over 20,000 acres in the area. The slash or brush piles are now created to thin the forest, clean up the forest floor, and remove potential fuel for wildfires. 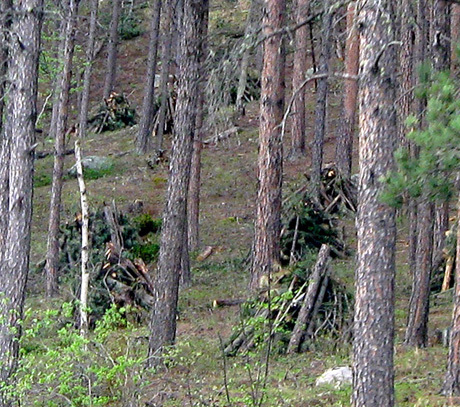 Foresters spend a lot of time creating all the slash piles each spring. The piles dry out during the summer and are burned in the winter when fire danger is low. This system has been very effective in keeping the forests more healthy in recent years. I've already described the 18-mile Wildlife Loop, which forms a large U in the middle of the park. We began the loop in the NE part of the park near the main visitor center and Game Lodge on Alt. 16 and drove clockwise until it intersected with scenic route 87 on the west side of the park. The Wildlife Loop is mostly comprised of hilly woodlands and open meadows. It has a very different feel than the rocky, mountainous Iron Mountain and Needles roads. You still need to go slowly, however, to maximize the chance of seeing wildlife (and not running over it). Hwy. 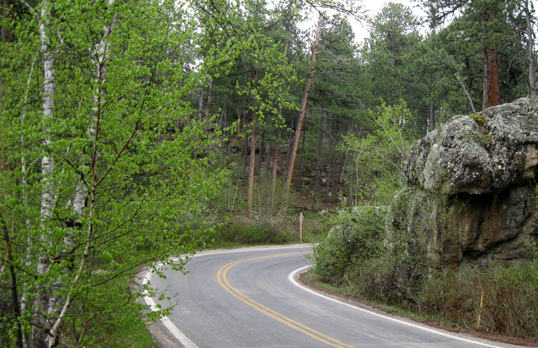 87 is a scenic highway that traverses the western side of Custer State Park. 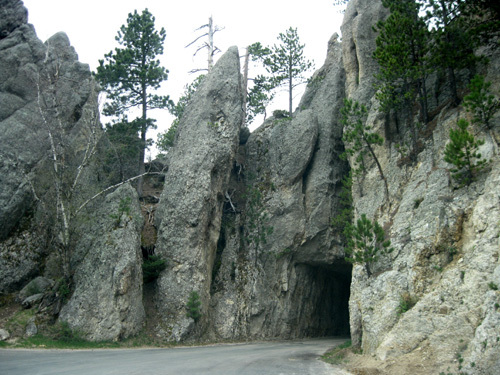 It continues north to become the more famous Needles Highway, another circuitous route that carries visitors through the rocky northern third of the park. 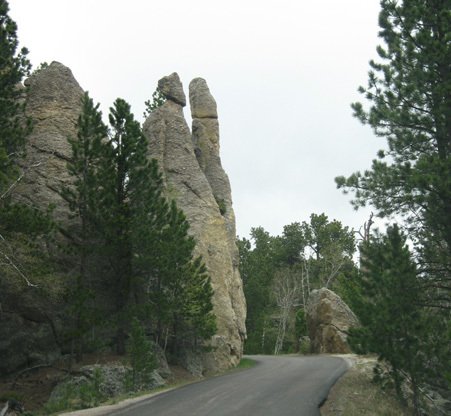 This is the road that Peter Norbeck first designed so visitors could see some of the fabulous rock spires and other land formations for which the park is renowned. He deliberately designed it for slow travel. 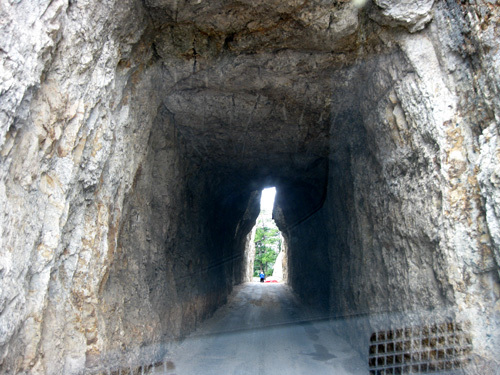 On this 14-mile route visitors are treated to two or three very narrow tunnels (one is only eight feet wide, another nine feet wide) and lots of granite towers that give the road its name. I was at the wheel through this section because Jim wanted to nap. That limited the number of pictures I took, but if you know me, I'm not above taking lots of "windshield shots." I did the best I could to capture some of the scenery while driving and not run off the road or wake Jim up. 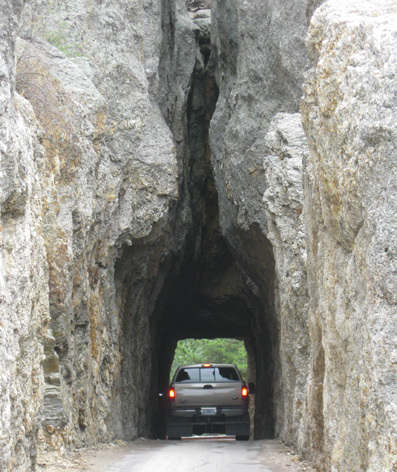 This tunnel is 9' wide and wasn't a problem in the truck. Jim was still asleep. We pulled in the mirrors on both sides of the truck so I didn't scrape them as I inched through the tunnel to the delight of the spectators watching at the other end! You can see two men watching from the other end. The tunnel was enclosed, then open at the top on the far side. Too funny. Well, actually, a little nerve-wracking going through but fun once we got out on the other side and joined the spectators watching the next drivers come through! There's no way you could get most campers through there; I felt like I barely had room to get our truck through it. It's probably about the same size as the one above. It was a lot of fun once I got through it, though. Once past the tunnels and the scenic Sylvan Lake area (lodge, campground, picnic area, store, etc.) we drove out of the park (still on Hwy. 87), past Harney Peak (at 7,242 feet, South Dakota's highest point), and got on Hwy. 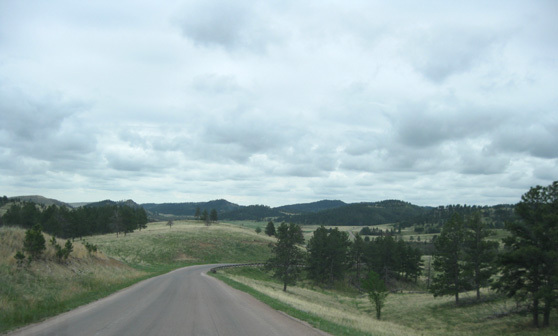 16 north toward Hill City, where I ran on part of the Mickelson Trail. I'll talk about that in the next entry. WHAT ELSE CAN FOLKS DO IN CUSTER STATE PARK? We left lots of things to do in future visits here, particularly exploring the extensive trail system. Some things, like Little Devil's Tower, you can see only on foot. Twenty-two miles of the lengthy Centennial Trail wind through the western side of the park and empty into Wind Cave National Park to the south. Other trails go to Badger Hole, the French Creek Natural Area, Sylvan and Legion lake areas, through the prairie, and around the various lodges. 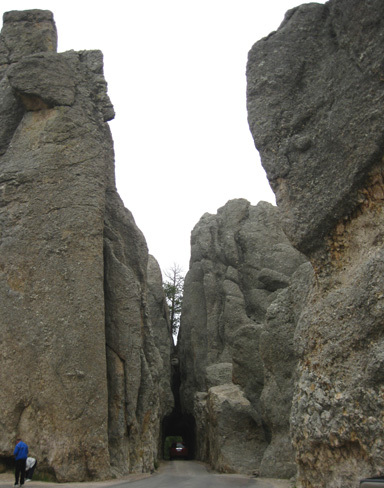 Additional trails that originate in the park take hikers beyond park boundaries to Harney Peak, Cathedral Spires, Sunday Gulch, and other destinations. Other outdoor activities in the park include mountain biking and road cycling, rock climbing, horseback riding, photographing wildlife and scenery, birding, boating, swimming, fishing, hunting, snowmobiling, and cross-country skiing. The park conducts all sorts of interesting naturalist and history programs and sponsors numerous special events besides the buffalo roundup. Examples are a volksmarch, arts festival, conducted hikes to Little Devil's Tower, guided nature walks, a Halloween night hike, the Buffalo Wallow Chili Cookoff (each recipe must contain some buffalo meat), gold panning, geocaching, jeep rides, wildlife caravans, hayrides, chuck-wagon cookouts, fly-fishing trips, and more. 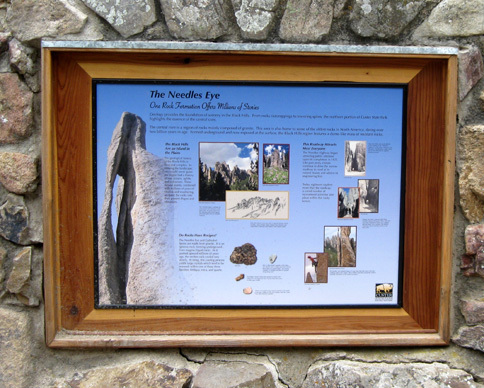 There are several activities that are of interest to history buffs, such as the "Badger Hole." That's the affectionate name for the cabin occupied from 1927 to 1957 by one of the park's more colorful characters, Badger Clark. South Dakota's first poet laureate, Clark gave lectures, told stories, and recited his poetry at many gatherings. He lived a simple, independent life yet loved to socialize with people. His cabin is open for public tours during the summer. Most of the buildings, roads, dams, tunnels, and bridges in the park were constructed by the Civilian Conservation Corps during the Great Depression (the one in the 1930s, not 2008-9!). Someday I'd like to check out the Gordon Party's stockade the CCC rebuilt along French Creek, as well as other historic buildings they constructed. One is the attractive Peter Norbeck Visitor Center. We would have spent more time looking at the exhibits there if a busload of school kids wasn't inside the same time we were there. Three of the five handsome stone and wood lodges in the park date back to the 1920s and '30s. We drove past all of them but didn't go inside any of them. I'd like to. Sylvan Lake Lodge replaced a Victorian-style hotel built in 1895. After it burned down in 1935, architect Frank Lloyd Wright suggested its current location. The current lodge was built in 1937, expanded in 1991, and remodeled in 2008. Legion Lake Lodge, located along Galena Creek near the southern end of the Needles Highway, dates back to 1913 when the state park was still a game preserve. Its setting by Legion Lake is very pretty. I didn't go into the lodge but did visit the nearby store briefly. The State Game Lodge, which is on the National Register of Historic Places, was built in 1922. It served as the summer White House for President Calvin Coolidge in 1927. The rooms have been renovated recently and the new Creekside Lodge built on the grounds in 2008. Blue Bell Lodge is set in a more remote location along French Creek at the base of Mt. Coolidge. It was built in the early 1920s by an executive at Bell Telephone and named for the company's bluebell logo. This lodge was also renovated last year. There are several options for overnight accommodations inside the park. I've already mentioned the lodges, each with its own unique "personality." They offer historic lodge rooms, hotel, motel, and cabin choices. The lodges have resort-style amenities that include some or all of the following: dining rooms, lounges, lobbies, meeting rooms, auditoriums, general stores, gift shops, gasoline, and various programs and activities. 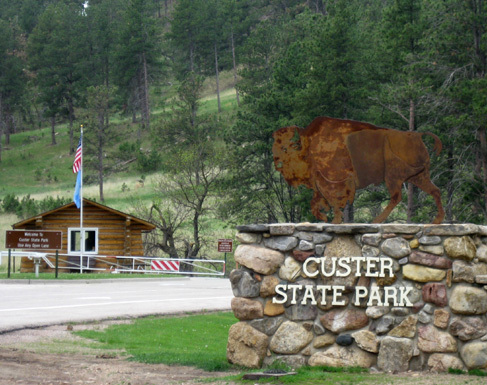 There are also various camping options inside Custer State Park: one-room camping cabins, campsites with or without electrical hookups, primitive campsites in the French Creek Natural Area, the French Creek Horse Camp, and two group campgrounds. Some of the campsites can be reserved and some are first-come, first-served. 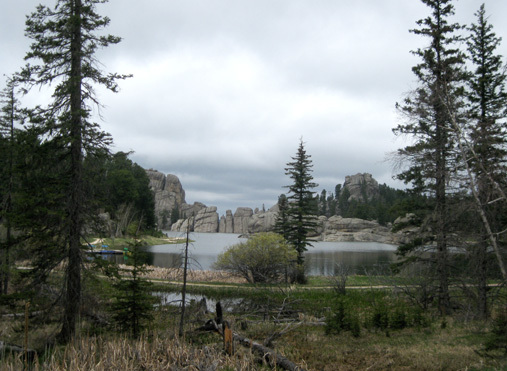 There are also numerous lodging and camping choices outside the park in surrounding communities like Rapid City, Keystone, Custer, Hill City, Hot Springs, Lead, and Deadwood. So . 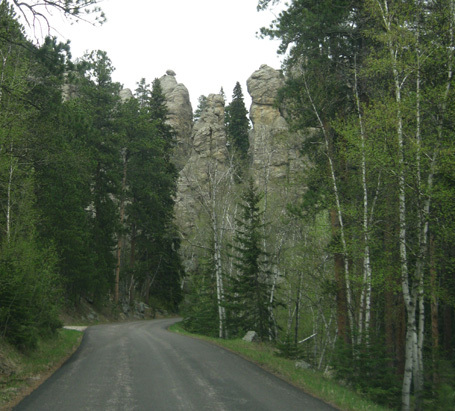 . . we have lots more things to explore in Custer State Park and the entire Black Hills area. We highly recommend spending a few days here to enjoy some of the many natural and historical activities that are available.